Tourist maps or maps from guidebooks help you to find tourist attractions; they do not show the travel difficulties of mountains and rivers well. When you look at maps of countries, you need to find three to four types of maps, one is not sufficient. For educational purposes, I am going to show you three types of maps. Compare Maps to understand a country quickly. The maps of Lonely Planet are good. I opted to buy the Lonely Planet guidebook for Ethiopia on a PDF file; I am trying to read it on my computer. I am not able to just flip back and forth between maps and text, truly the book form is much better. I am having trouble understanding how to travel in Ethiopia. 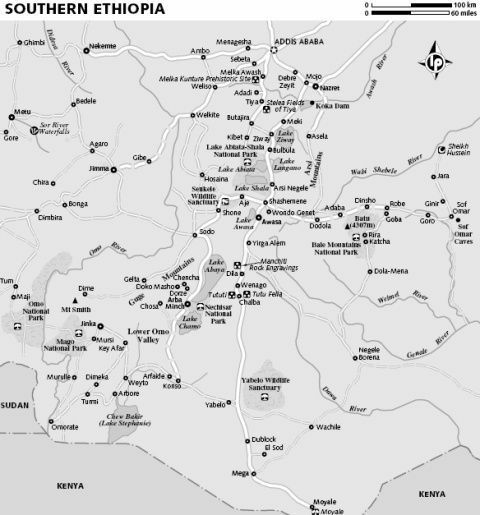 The map from my PDF file of Lonely Planet Southern Ethiopia. This is a tourist map. This is a road map. It does not show mountains and rivers well, and fails to show size of cities. Problem, it is focused only on the tourist attractions. WARNING - African guidebooks assume you are driving a car, I could get to one of these locations on the map and there may not be a Hotel, and normally the guidebook writers are on a budget five times higher than me. Notice how there is mountains and rivers, however obscured by the cities and roads. This is comprehensive view from the Microsoft Encarta Encyclopedia map; I 100 percent recommend a traveler have this program. This is a wide view; I can zoom in right down to the specific areas of the map. I can find the size of cities, the roads, names of cities, however much different from the guidebook. I cannot find tourist attractions; however, I can find reality better with this map, and not only what the guidebook writer considered important. I will read the articles for example and learn what they grow or manufacture in this country, it may not be interesting to tourist, and however it may be to me. 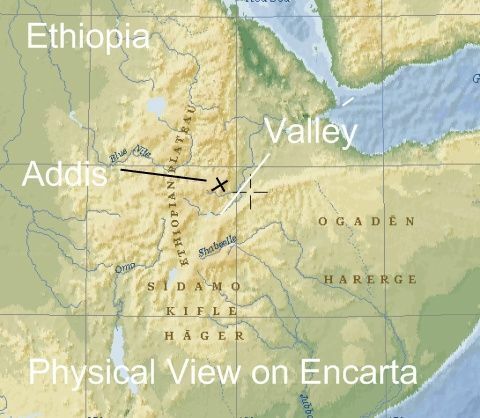 This is the Physical View on my Microsoft Encarta Encyclopedia map of Ethiopia. Suddenly all the rivers, mountains and contours of the land stick out. 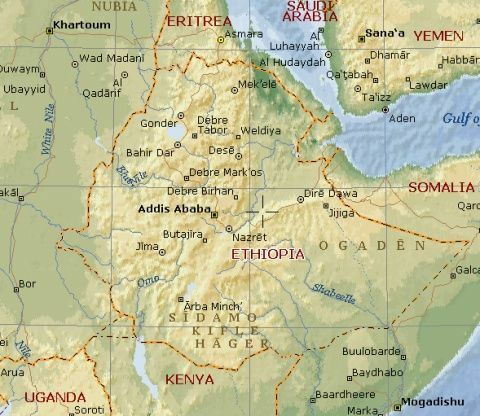 What have I finally learned about Ethiopia? Addis, Ababa the biggest city is up on top of a mountain or plateau, when I go south I will descend into the Rift Valley, which leads towards Kenya. Traveling in Valleys is easier than traveling in Mountains and also warmer, being I only have one pair of long pants and many pairs of shorts this is important.